Pickling is a simple process that is easy enough for a beginning canner to try, with a lifetime of fun recipes to play around with. The perfect balance of salt, vinegar, water, herbs and spices, makes your food not only safe, but also tasty. Each ingredient has a role to play, making the pickling process a little bit of magic and a little bit of science. 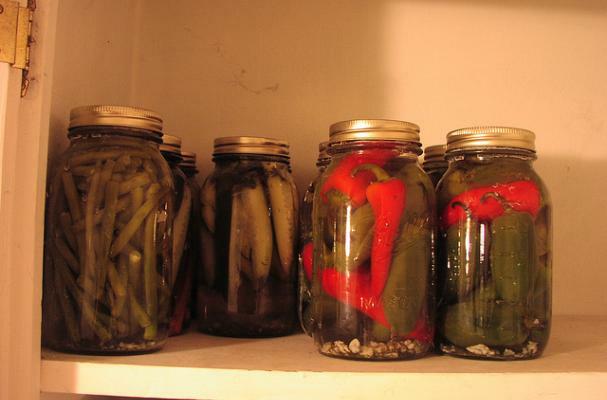 If you want to start pickling, you need a water bath canner, canning jars (if you buy them new, they come with lids and bands), a jar lifter and ingredients to make into pickles. Seriously, that is all. Because pickles are a high acid food, there is no need to use a pressure canner. If you are lucky enough to have an abundance of tomatoes, they are also a high acid food and can be water bath canned. The interesting thing about making pickles is that although the acid remains high throughout, adding sugar to make a sweet pickle is fine. The sweetness will cut the tart flavor of the vinegar, but not change the overall acidity. Always use soft water to make the best pickles. Too much iron an discolor the finished pickle. If you have particularly hard water, use distilled water instead. Use pickling salt, not table salt. The added iodine in table salt will cause the pickling liquid to become cloudy, and that is just plain unappetizing. Use white vinegar. Although you can use apple cider vinegar, the flavor will be different and the pickles will be a strange color. A gray pickle is sort of weird. Now comes the fun part, the recipes. I like to pickle all sorts of food, not just cucumbers. Check out some of these favorites. Trust me, these are so good! Aren't these the perfect answer to an overabundance of green beans? Does anyone have a canning recipe for sweet jalapenos?